What? 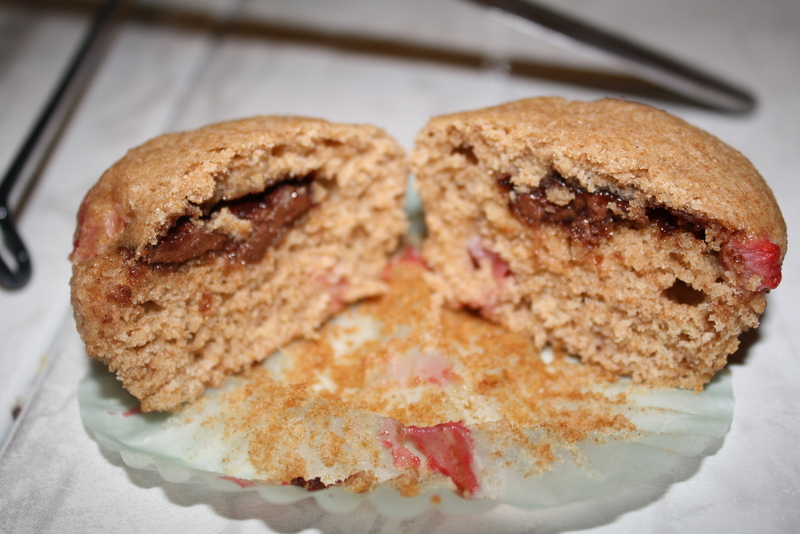 Chopped up strawberries and Nutella filling in a healthy whole wheat muffin? Could it be so? OH YES. My friend, Brooke, gave me this recipe and I knew I had to try it out ASAP. They are as delicious as they sound. I am taking Brooke a plate of them to school. I hope she likes them as much as I did. Since I have lost so much weight (57 pounds! ), I am a sucker for snacks that are healthy. These are healthy on so many levels: whole wheat flour, fresh fruit, orange juice, skim milk, AND Nutella! Just a tip: I would probably either serve these warm or reheat for a few seconds in the microwave. I think that would probably make them yummier! Here’s what the batter looks like when you add the Nutella. You fill the liners half full, add a dollop of Nutella and fill them the rest of the way. They’re really simple to make. Look at these delicious things! In the picture below you can see the Nutella inside of the muffin. YUM. Mix the dry ingredients in a large bowl. Mix the wet ingredients in a small bowl. Add the wet to the dry and add the strawberries. Stir only until combined. Fill each muffin cup half full with batter, then add a teaspoon of Nutella, then fill the muffin cups. Bake at 350 degrees for 17-20 minutes, or until a tester comes out clean. This is one of those OMG recipes!! My kids would devour these guys!! Love it!